Keep learning. You’ve only touched the edge of the issue. Develop your judgement, which is essentially decision making under uncertainty. Pattern matching: keep growing your pattern matching database, and be very conscious about it. Heard on the a16z podcast for March 26, 2018 with Andy Rachleff, Wealthfront founder and CEO. A frequent topic I talk to other leaders and managers about is how to influence change. This goes for anyone working in a team, of course — not just managers. I’d like to share how my ideas have evolved in the last year or so as I’ve scaled up my own role at Automattic across bigger teams and projects. Early in my career, my mental model centered around influencing others to change. Whether by having bright ideas myself and communicating a clear vision, selling and pushing others’ best ideas, or simply wearing the other parties down by being persistent. Through experience and mistakes I can now see that pressing my mind against others’ isn’t the most effective way to work together. I could try to convince someone to see my way by force or pressure, but it won’t last long. Nor is it a healthy environment for collaboration. My mental model for leadership now removes influence from the equation. Instead of convincing or controlling, I start instead by creating the right environment for change. A space for sharing insights and lessons together to build momentum. A space where change comes naturally from individuals and teams themselves. “Your job as a leader is to edit more than you write,” to paraphrase Jack Dorsey. Creating this space is a major component of a healthy company — you could even say it’s the key to a productive and effective team culture. I’ve certainly seen it in the last year on my team at Automattic. I’d read McChrystal’s book Team of Teams just before seeing the video, and both carry the same message. How over his military career he evolved his leadership style, going from command-and-control to empowering. A leader as more of a gardener than chess master. The connectivity of trust and purpose imbues teams with an ability to solve problems that could never be foreseen by a single manager—their solutions often emerge as the bottom-up result of interactions, rather than from top-down orders. The role of the senior leader was no longer that of controlling puppet master, but rather that of an empathetic crafter of culture. McChrystal calls this a “gardener” role, and it fits my mindset perfectly. The temptation to lead as a chess master, controlling each move of the organization, must give way to an approach as a gardener, enabling rather than directing. First I needed to shift my focus from moving pieces on the board to shaping the ecosystem. Creating and maintaining the teamwork conditions we needed—tending the garden—became my primary responsibility. This is now exactly how I view my own leadership model: Create the space for great work. A note to my readers — if you’re new here, hello! Old time simpledream readers, drop me a line if you’re still with me in this journey. I’ve evolved the blog a bit to focus on my journey as a leader, though still connected to WordPress and front-end engineering and web standards. Readers, I welcome your thoughts in the comments or via social media. Better yet, post to your blog and link it back here. I’d love to continue a conversation about what you’re learning and seeing as well. 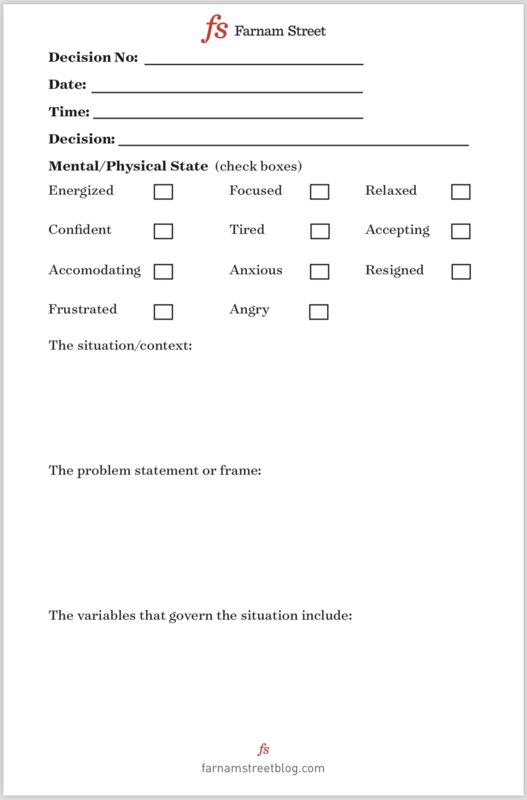 Decision journals are designed to create a log of the decisions you’ve made and why you made them. To both capture a snapshot of your thinking at the start, then use the notes to improve your decision making process when you review it later. I first heard about decision journaling when Ian Stewart pointed to a Farnham Street post a few years back. Then it came up again in late 2017 via Matt on the OFF RCRD podcast. I decided to take another look. Screenshot of the Farnham Street post about decision journals, highlighting the need for quality control of our decisions. “You can think of a decision journal as quality control” for your decisions — yes, that fits my mindset. A quality check in six months or a year to prevent hindsight bias. 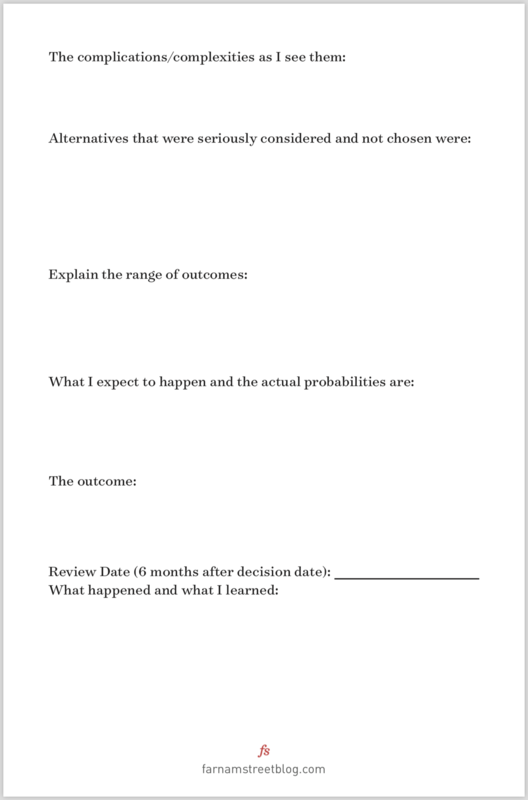 Here’s the Farnham Street template as a downloadable PDF: Decision Journal Template. I haven’t made this a standard practice yet, probably because it feels like too much overhead. These days when reviewing success and failure I find myself reflecting back without a full picture of where my mind was at the start. What have a I learned in between? Will I repeat the same mistakes? How can I repeat the top bets that paid off? For example, for a given decision, what do I expect to change? What am I betting on, and how will I know if I’m right or wrong? In 2018 I hope to be better at stating my intentions ahead — taking the time to create the snapshot of my thinking at the start. Blogging this publicly to keep myself accountable for journaling the decisions at the start. Bonus: Two recent mental models for framing your decisions as “bets” that I’ve come across, in case you find them helpful. Mind the Product’s bet matrix, via Brie Demkiw. “I bet that [this decision] will create [this outcome]. I’ll know I’m right when I see [this evidence]. Screenshot of the Bet Matrix by Mind the Product. Make your decisions as expected value calculations. Think of every decision as a bet with a probability and a reward for being right and a probability and a penalty for being wrong. Suppose something that has only a one-in-five chance (20%) of succeeding will return ten times (e.g., $1,000) the amount that it will cost you if it fails ($100). Its expected value is positive ($120), so it’s probably a smart decision, even though the odds are against you, as long as you can also cover the loss. I first heard the concept of uncovering competing commitments in a talk by Rich Sheridan of Menlo Innovations. On the topic of embracing change he pointed to the act of uncovering as a key activity when teams are blocked. And when addressing low performance. When someone isn’t performing well, how do you motivate them to change in the positive direction — without using fear-based tactics around losing their job, if they don’t turn things around? For general performance issues, always check in with them as a person first. What are their other commitments? [He then referenced the HBR article about reasons for people’s resistance to change]. If it’s truly a performance issue that needs addressing, and the fear is no longer artificial, communicate that clearly as you kick it off. Curious to dig in more, I thought: what are other possible causes of low performance, and how am I doing in my assessment of those cases to separate the perception from the truth? Screenshot of the Harvard Business Review article, “The Real Reason People Won’t Change” (2001). Competing commitments are detailed in the article Rich shared: The Real Reason People Won’t Change. The authors describe concealed commitments that block change where people hold on to and hide their assumptions. To get to the truth, they suggest an exercise is to turn the questions or complaints around — rephrasing them — to find out what they are worried about and how it’s preventing their success. And more important, which part they play in resolving it. At the team level this exercise often takes a deeper dive over a long period of time. Something I haven’t found on my teams that we take time to do, especially with large groups of people, many moving parts, and urgent deadlines. Partly because taking the time derails progress; the abstraction of examining complaints and gathering enough data to find the source of low performance. That takes precious time away from shipping continuous product iterations for customers, which is our primary mission. One pattern I’ve seen with projects that go on too long, the responsible parties in the end often admit they didn’t know quite how to solve the problem. Or, they ran into a blocker that needed help outside the team. But they didn’t feel comfortable openly admitting it. Based on this research, I can now say that disagreements passively held are often indistinguishable from poor performance. A lack of passion or drive — which in turn blocks progress to follow up or complete something — could indicate someone isn’t connecting personally to the goal, or to our company culture, or their team. Which helps answer the questions: 1) Why does someone “go dark?” and 2) Why does a team underperform? A key point from my experience is that when you uncover the assumptions behind the low performance, you might find out that the underlying fear or disagreement is real. By pointing to something real — together — you can discover the missing alignment. The commitments made after that discovery shine the light on the truth and guide the next steps. Steps toward clarity and alignment. Still haven’t found a better list than Amazon’s Leadership Principles. Concise, clear, ambitious. A benchmark. Bookmarked this in 2017, now printed it (on paper!) for a weekly read and review. As my product lead role evolves I’ve started to see patterns emerge in my work across WordPress.com teams at Automattic. Two that keep coming up for me are focus on people, not technology and be a quality driver. I’d like to dig into the Quality Driver aspect in this post. Here’s a recipe for success as a product lead that I’ve now written down on a paper card near, and placed on my desk. I’m working on internalizing it as I put it into practice. + Know how we want to communicate our message. + Understand our business goals and core mission. + Keep in touch with where the technology is headed. Driving quality as a product lead takes place at many levels, from strategy to operations to tactics. At the highest level we write stories — sometimes framed as bets — to set the vision. Then working with teams on projects, schedules, organization — all the way through to the details of design, engineering, marketing, and support. Another way I’ve to frame this Quality Driver is in the form of a job description. A bit aspirational and ambitious to motivate me to grow and scale my product leadership. It’s my new mindset. Strategic — Raise awareness for the top issues facing our customers, and coordinate with teams to make the needed product changes. Pay attention to the end-to-end experience of our products, acting as the chief quality officer. Hold a holistic view across the business and own every aspect of the customer journey. Operational — Act as an effective facilitator between developers, team leads, and company leadership. Align team resources to company goals and product initiatives. Engage with product teams for effectiveness, motivation, and project management. Build a culture of trust, quality, and high performance. Strategic — Communicate a strategic vision and turn it into action. As a compassionate and effective product steward, use the ability to succinctly communicate our CEO’s vision to teams, as well as communicate everyone’s aspirations to the CEO. Find the gems, bring them to light, and move the needle. Work on the right things, avoid crashes, and be a few steps ahead of everything — knowing how every change fits in with our plans. Help everyone understand the context of their work and the broader vision for our products. Business growth for a sustainable and profitable future. Better customer engagement and satisfaction. A natural and healthy flow of communication. The happiness and effectiveness of teams.